Tourist information for South-East Ireland from Drive-Alive. Touring in Tipperary Wexford Waterford Kilkenny Carlow by car. Tourist information for Ireland South-East. Drive-Alive Holidays in Ireland South-East. South East Ireland tourist information. Great prices on self-drive holidays to Ireland. Ferry inclusive or accommodation only. The South-East region of Ireland comprises the counties of Wexford, Carlow, Kilkenny, Waterford and the southern half of Tipperary. This is an area of contrasts, from the soft lush coasts of Waterford and Wexford through the agricultural heartlands of Tipperary and Carlow to the rich Norman heritage of Kilkenny. A circular tour of this region might start at Rosslare ferry port. From here head west towards Waterford, taking the ferry from Ballyhack to Passage East, or take the main N25 via Newbawn, through New Ross with its Dutch-style houses. 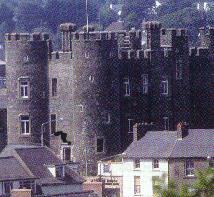 Waterford, home to the famous crystal glass works, is worth a longer stay. 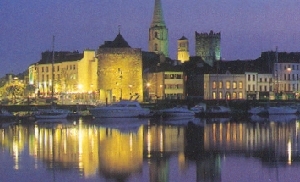 The town is attractively situated on the river Suir and its compact centre is home to a number of excellent restaurants, and most nights there'll be a bar featuring local musicians. The coast west of Waterford is a mixture of pretty resort towns like Tramore, largely untouched coastline with fine beaches around Stradbally, and small fishing villages like Dungarvan. Heading north towards Tipperary takes you via Clonmel, close to the lovely Knockmealdown Mountains, to the town of Cahir, dominated by a spectacular castle dating from the 13th century. 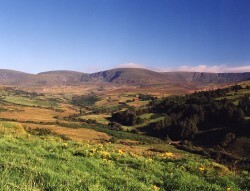 Further north still is the peaceful countryside centred on Dundrum. The Slieve Phelim Hills are excellent for walking, with delightful woodland trails. Several rivers flow through the neighbouring Golden Valley, offering anglers many possibilities. 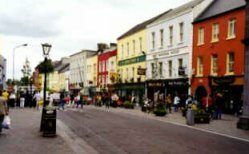 Returning eastwards, you can stay either in Kilkenny, considered by many to be the most cultured town in the Republic outside Dublin, or nearby Ballyfoyle, a real country hide-away, close to the famous Dunmore Cave. Carlow, on the border of County Wicklow, is home to the Browne's Hill Dolmen, believed to have the largest capstone in Europe.